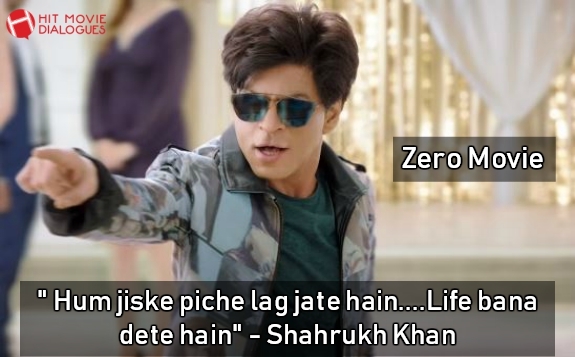 Hello Guys, Here we sharing best dialogues of Shahrukh from Zero movie. This is an upcoming romantic drama film written by Himanshu Sharma & directed by Aanand L.Rai. Shahrukh Khan, Katrina Kaif and Anushka Sharma are playing the main lead role. Shahrukh Khan is in the new avatar, he is playing a character of a dwarf. The story plot of the film, Khan who falls in love with a superstar actress played by Katrina Kaif. Anushka Sharma is playing a character of a girl with an intellectual disability. The teaser of this film has already released, The teaser has received about 17 million views to till date. The video showed Shahrukh Khan is singing and dancing to Mohammed Rafi's song "Hum Ko Tum Pe Pyar Aaya". It is set to be released on 21 December 2018. This teaser has only one dialogue which is delivered by Shahrukh Khan. Here we share the famous dialogues of Zero movie. "Abe Ladki mil rahi hai tujhe..shaadi karne ke liy...varna tujh jaise ko launda na mile"
"Ek vahi toh..thi.......Jiske ankhon mein ankhon dar kar baat kar sakta tha...Vo mere barabar thi...main uske barabar"
"Main akela hi Chala tha janib-e-manzil magar, Log Saath aate gaye aur karwaan banta gaya"
"Taliyan banta hai na santa hai.....Yahn sirf Janta hai"
"Baap nahi hu......taksal hun...haath dala aur paisa aa gya"